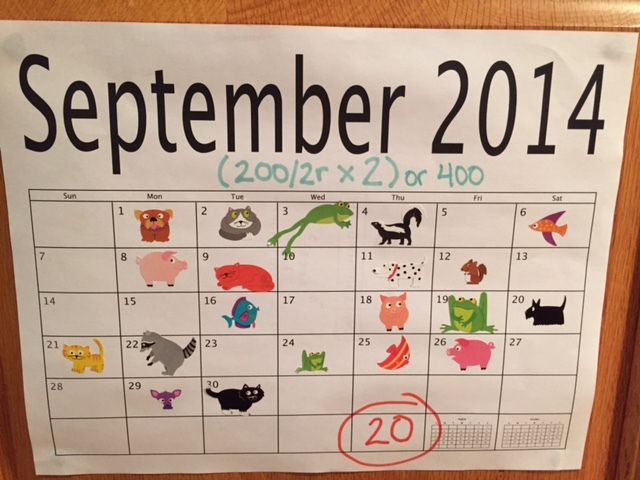 When I kicked off September, I told you of my sticker/calendar plan for being more accountable in my writing. #writesticky The original goal was to shoot for a very reasonable, attainable daily word count. I started off working on two very different WIP’s so I split my goal to at least 200 word on each piece, but I also gave myself room for revising. Ultimately my first month using stickers was successful, but over the course of the last few weeks I’ve made a few changes. I’m going to tell you what they are and why I made them, but first a look at September. Woo hoo! 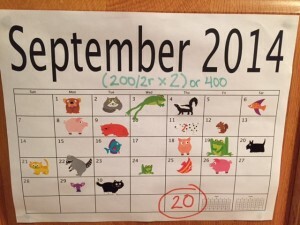 I earned 20/30 of my adorable stickers. There were a few days were I got in some writing, but real world distractions kept me from getting my reward. So close… *sob* But there were also days where I wrote way more than my goal. As I mentioned earlier, I quickly started seeing ways in which I wanted to modify this accountability system to suit me better. The first thing I discovered was that I didn’t always want to work on both manuscripts. When everything is clicking with one WIP, it was counter productive to stop one project to hit my word count in another. So, shortly into the month, I gave myself the option of writing 400 words for the manuscript of my choice and I was really happy with that. Next I decided that I didn’t want to count revision towards this goal. I have a tendency to let my inner editor have too much room in the drafting process (which isn’t always good) so I decided that I could revise all I wanted, but I still needed to hit my 400 word count. I was all set to do even better in October than September when outside forces really made me reevaluate how I wanted to use my calendar and stickers. I saw everyone abuzz on FB and Tumblr. 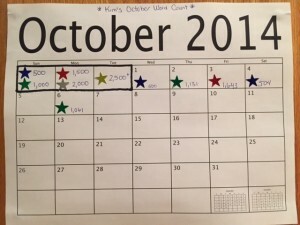 Victoria Schwab started doing this neat little calendar with stars. You can check it out HERE! I LOVED it! Basically, I get a calendar and a variety of colored stars, and make a key each month based on what I need to accomplish. And I’m also writing in the actual word count. Because let’s face it, 1,643 is different than 1,500 when you’re counting words. 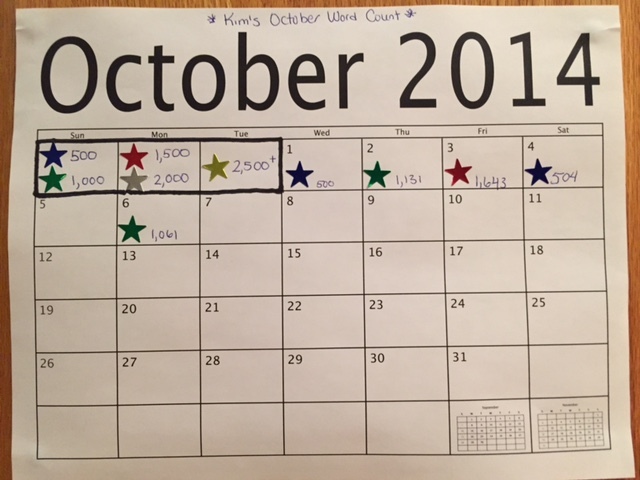 And I loved how Victoria was able to see what her total was at the end of the month. That’s motivational. So, that’s what I’m doing now and as you can see, I’m doing pretty good so far. *fist pump* Almost 5,000 words in 6 days and only one day I didn’t get to write at all. Although, I’m thinking of throwing a notebook in my bag when I’m on the move and seeing if I can get those mobile words in. Sometimes I forget I’m not surgically attached to my lap top LOL! What’s also great about what I’ve been doing is I also feel like September and October are getting me prepared for NaNoWriMo. I really want to do this again. So…if I can get far enough in the draft of the book I’m working on, I might feel comfortable putting the MS away for a much needed break and starting a draft of something else that’s been brewing. Something I’ve been scratching out notes on. Something that’s been tugging at the corners of my brain when I run and when I’m dozing. I don’t know if it will make sense to drop what I’m doing. If I’ll be far enough along to switch gears. But we shall see. Part of me thinks it would be delicious–having two drafts to revise. Drafting is always the hardest part for me and the NaNo momentum is just amazing. I loved it last year. I learned so much about myself and my writing process. But I think my October calendar will tell me what I need to know as I get closer. And what about you? Hope you’re having a lot of success with your calendar or whatever form of accountability you’ve chosen to get the words on the page. I’ve been re-listening to WRITING DOWN THE BONES and I just caught a segment today about how writing is like running, which you know made me smile. The gist of it was that people who want to be good at something train. They show up. They do the practice. Running is hard, but if you do it enough, you start to get into a rhythm that gets you back out on a regular basis. You learn to love the practice. And I believe that. In August I ran 7 miles, I don’t think I ran much more than that in the stretch of months before that. A long stretch. But in September I ran just over 75 miles and I’m sticking to around a 20 mile a week pace as I’m hitting October. It feels good to be showing up to my runs and my writing. Tell me what you’re practicing.